Wondering where to go for great craft beer and tasty grub this year? While I usually recommend a full stroll around the grounds to check things out for yourself, allow me to save you some time and steer you towards Aichi’s Hyappa brewing. They will have a booth at this year’s Fuji Rock for the 3rd consecutive year. I’ve personally enjoyed Hyappa’s great drinks and chow the past two years at Fuji Rock. I can say from experience, for those of us with discerning taste, the Hyappa booth is not to be missed. I’m sure you might have a few questions, like where can I find the booth, what are they serving up this year and what exactly is Hyappa brews all about? Well, fret not, I got a chance to chat with Hyappa head honcho Craig Morrey (pictured center with 2 thumbs up) to answer these questions and more. 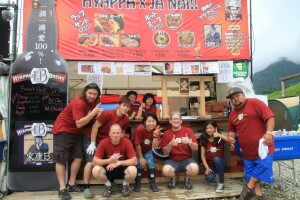 Read our detailed Q&A below and when you visit the Hyappa x Ja Nai!! booth this year don’t forget to tell em James sent you! FR: Hi Craig. Can you give a brief intro to the readers. What is Hyappa brews and Izakaya Ja nai? How did the bar and brewing start? CM: After my Japanese “father”, ie the master of my favorite local, had to close his izakaya, we transformed it into Izakaya Ja Nai!! almost 16 years ago as a place for people to meet in Okazaki. Unlike most izakayas where you mainly talk with the people you went with, our place is more like the corner pub. Chances are, you will either see a friend or make a new one soon after walking in the door. We like to think of ourselves as Chicago Pizza meets Cheers somewhere in Asia. After the Lehman shock, we decided to focus our efforts on value-added service and products, thus the founding of Hyappa Brews- our very own craft brewery. Building on our desire to bring people together, we thought the world’s most social beverage would be an excellent adventure. FR: How many beers do you brew? What food do you specialize in? CM: Our brewery is quite small which gives us the advantage of being able to play more without as much risk. At the moment, we have 12 standard brews (give or take), plus a lot of one-offs or experiments so it is a difficult question to answer. We don’t consider a beer as a standard unless we have a name and concept we really like. For example, we recently brewed an American Pale Ale, but won’t start selling it outside Izakaya Ja Nai!! and a couple regular customers (mainly to get feedback). One possible name is MAGAle, but that might turn off a lot of people despite the obvious sarcasm. In contrast, G’dAle Mate is our Australian Pale Ale which will be available to everyone soon. From a food standpoint- our focus originally was American Bar/ comfort food- pizza, nachos, buffalo wings, etc. We have always served Chicago style pizza; however, we built a brick pizza oven 10 years ago and have since been specialized in both Chicago and brick oven pizza. We make everything from scratch including our house bacon (served at Fuji Rock!) and incorporate spent grain into the pizza dough. For events, we are more of a BBQ joint with burgers, pulled pork and beer brats. FR: What will you have on offer at the fest this year? Planning any special beers or food? CM: We are still planning our menu and deciding which beers will be on tap. After hanging out with G.Love at last year’s Fuji Rock though, we decided to change a main wrap sandwich from Pulled Pork to Philly Cheese. We will also definitely have our hand-made bacon and egg wrap in the mornings. Being in the campsite, we are well aware that beer and donuts comprise the breakfast of champions, but… we will find some way to combine things by including some of our spent grains in muffins, scones, toast or some other breakfasty type food. Another staple is our Tonjiru featuring Okazaki’s own Hatcho miso and a Sake-kasujiru to be introduced this year. For more traditional breakfast drinks, we are teaming up with a local coffee roaster to for 3 different coffee blends. Our hot coffee will be a special blend only available at Fuji Rock (gentei). Our ice coffee (served from beer kegs via are new beer server) is the “Hiraya Blend”, named for the roaster in Gamagori. Finally, we will brew a Fuji Rock Milk Coffee Stout with Hyappa Blend beans. For special beers, we are brewing an Oatmeal Stout and the Coffee Milk Stout. We will probably have 5-6 taps. 1 for ice coffee, 1 for Stout, probably 3 of our regular beers and 1 rotating tap to keep things interesting for the campers. As usual, we will have our famous Bloody Mary for hangovers and hot-buttered rum to warm you up at night. FR: Where can we find you at Fuji Rock this year? CM: We are in the campsite area again. We are also exploring the possibility of having a couple other vendors serve our beer, although the logistics are a bit difficult. Last year we were in the Palace of Wonder so everyone had a chance to buy our beer. Being in the campsite area, only people with camp passes will be able to drink our sweet elixirs. One camper told us last year she specifically bought a camp pass after tasting our beer the first year. She was initially disappointed to not see us in the campsite, but greatly relieved to find us in Palace. I have to say that was one of our best Fuji Rock highlights. FR: What are your impressions of the festival? Did you notice the lack of quality beer and try to fill that void? CM: Actually I had never been to Fuji Rock before becoming a vendor. Being a part of one of the biggest, most famous festivals in the world is certainly an experience. We see things from a much different perspective though. Sponsorship is a big part of making it happen so I can understand the draw for having a big name beer involved. That being said, I am all for variety. One of the organizer’s main focuses is to have great food and drinks- if you planned on serving karaage and yakisoba, you would probably never be selected to participate. We just offered our best quality and were fortunate to be selected. FR: Will you have some time to explore Fuji Rock this year? What are you looking forward to at this year’s fest? CM: I usually try to find a few hours to see friends in the different areas and to just check out the overall vibe. They are revamping the World Restaurant area so that could be interesting. I got to know the artists/ etc. at Palace last year so will probably have a few drinks with them. We try to allow our staff a chance to see some of the acts, but it doesn’t always work out so well. Fuji Rock is more work than most people realize- staff included. I must be getting old, because I don’t recognize a lot of the acts. I would love to check some of them out, but I will likely spend most of my time in the shop. I am looking forward to catching up with some friends from past festivals. Mainly though, I am looking forward to all the interesting new people I will meet. One big advantage of the campsite is that it is somewhat more relaxed allowing you to connect/ chat with people more than some of the other areas. FR: This will be your 3rd time at the festival, correct? Coming from Aichi, it’s a bit of a trek, what keeps you coming back? CM: Yes, this is our 3rd year. It is hard to explain really, just the adventure and a challenge I suppose. From the beginning, it was never about making money- just being part of something special, especially music. I have been in bands since 4th grade so it was a natural fit. I would have loved being at Woodstock (our tag-line of 100% Love in Every Drop basically encompasses my overall philosophy of life), but I am not that old. It is also a bit addictive- getting to know people over the course of 4 days because they keep coming back for your beer is a great feeling. FR: Any parting message for the readers? Please stop by to say “Hi”- people are really what make Fuji Rock an amazing experience. We certainly won’t complain if you buy lots of beer though. We hope everyone has a great time and that we are able to contribute to some great memories.